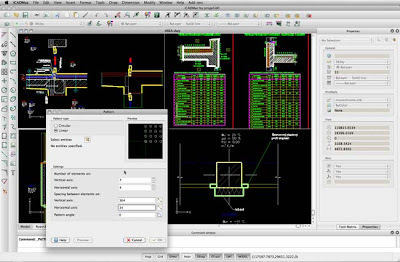 CAD on MAC OS/X (Version 10 or 'X' of the Apple operating System) is back. AutoCAD for Mac was (re)announced in August 2010. However, the cost of AutoCAD on Mac (several thousand dollars) makes this new option unviable for some small business looking for CAD software for Mac. As a low cost alternative to more expensive CAD on Mac systems, CADDIT will begin to offer the iCADMac product line from progeSOFT. Native Mac OS/X CAD software - no Boot Camp, VMware Fusion or Parallels virtualization required. Similar user interface to what some CAD for Mac users are already accustomed. Read and Write AutoCAD .dwg CAD files, edit and print. Table and cell support used for bills of materials, component lists and more. CADDIT will be offering an AUD$175 discount to RRP pricing until 22 April. Architects, engineers, technicians and other CAD users looking for "CAD for Mac" will also enjoy free upgrades to additional functionality released in the iCADMac product for 12 months from the date of purchase. iCADmac can be downloaded for a free for a 30 day trial HERE. Questions about iCADMac in Australia and New Zealand should be directed to CADDIT here. Note for Windows users - those looking for a reliable, low-cost 2D / 3D design solution on Microsoft Windows should download progeCAD for Windows HERE.